Oh my God! Did you see that shot of Miles falling out of the night sky and into the city while upside down? That was so awesome. And, Nic Cage as Spider-Man Noir in black and white when everyone else is in colour. Ha. Ha. Ha. And, and, and, Doc Oc's friends call her Liv but her enemies call her Doc Oc. Ha. Ha. Ha. Ha. Ha. Ha. And, and, and, did you see that scene where Miles makes his own Spider-Suit and suits up for the first time? Watching that scene made me feel like I wanted to be Spider-Man. I haven't said that sentence or felt this excited about a Spiderman film in 16 years. I wasn't even out of school the last time that happened. Watching the journey of Miles Morales (Shameik Moore) into becoming Spider-Man triggers a flood of joyous emotions such as the outburst above because his journey is both one we've seen before and can relate to, and also one that is observed through a pair of youthful eyes. As Spider-Man of the days gone by (Peter Parker played by Jake Johnson) says, "There is always a bad guy trying to destroy the world. There is always a goober (a tech-riddled device) that can save the world." And, if we may add, there is always a Spider-Man there to do it. Cynical Spider-Man knows that Wilson Fisk / Kingpin (Liev Schreiber) is hard at work trying to open an inter-dimensional portal in an attempt to retrieve his lost family which will, in turn, destroy multiple dimensions and end all life as we know it. But little does he realise that this time around he isn't required to do all the heavy lifting himself. The duo of Morales and Parker are aided by Spider-Gwen (Hailee Steinfeld), Spider-Man Noir (Nicolas Cage), Spider-Ham (John Mulaney) and SP//dr - a biomechanical Spider-Suit piloted by Peni Parker (Kimiko Glen). This half dozen of Spider-Men, Women, Children and Livestock work in unison to eliminate the global threat in the background while the real story of Miles' coming-of-age takes centre stage amidst this world of comedy-laced action. 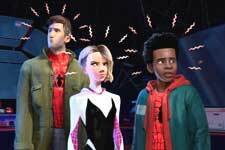 As ridiculous as the plot described above sounds, the strength of Spider-Man: Into The Spider-Verse is its excellent grip on toggling multiple tones from the viscerally dramatic to the downright ludicrously comedic. This tonal juggling act is exemplified by its immaculate world design and reinforced by the characters inhabiting said world. Everything from Peter Parker rediscovering his purpose to Miles Morales discovering what it means to be a hero is woven into this intricately crafted world which not so subtly conceals Spider-Ham dropping a cartoon anvil on a villain's head. So much mad science should not inhabit the same screen, but it does, boys and girls, and it is so very glorious. Simple touches such as Spider-Man Sr wearing sweatpants to Miles' dime store Spider-Man costume having eye holes cut out which in turn helps the audience to experience what he feels by looking into his wonderfully animated eyes are what set this film apart from the slew of superhero cinematic extravaganzas we are inundated with on a yearly basis. There is a joy, a sadness, a sense of triumph and, above all, a sense of personality that this film has, which have been sorely lacking since Sam Raimi's original Spiderman trilogy. This unique personality is a product of both the movie's voice cast and its presentation. The movie's sense of style is evident from its opening studio credits. The dotted texture (mind out of the gutter) of the Sony logo primes the audience up for a visual experience that is an homage to decades of comic book lore and artwork. While the wider shots of the film are animated with top-of-the-line 3D tech, the close-ups of characters' faces and the most important story beats are animated to resemble hand-drawn animated movies of old. The personal connection you feel with an animated film while observing lines move across a character's face while they carefully etch out every single emotion. This cannot be replicated by a wholly 3D animated movie. Don't take our word for it, just ask Studio Ghibli. When exceptionally animated characters and a well-told story are powered by pitch-perfect voice talent, the recipe for success has been followed to a tee. Shameik Moore, Hailee Steinfeld, John Mulaney, Nic Cage, Brian Tyree Henry and Mahershala Ali are all in top form as they infuse life into characters we get very little to interact with as they are moving parts of a massive ensemble. 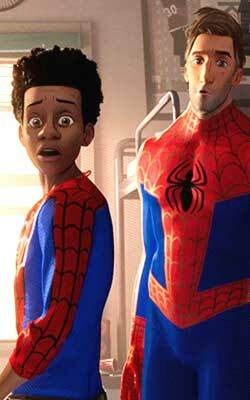 The stellar voice cast is topped off by Jake Johnson (Nick Miller, himself) as the grumpy, dumpy and chunky version of Tobey Maguire's Peter Parker. We here at fullhyd.com like to wax poetic and enjoy getting overly verbose about cinema, but when it comes to this film, we would much rather let it do the talking for itself. E B White once said, "Explaining a joke is like dissecting a frog (or a spider, in this case). You understand it better, but the frog dies in the process." We aren't so cruel. We've only analysed this particular spider safely and topically. This is because we want you to experience the magic of watching multiple spiders weave their complex webs and tell their sumptuous stories, for yourselves. fullhyd.com has 700,000+ monthly visits. Tell Hyderabad what you feel about Spider-Man: Into The Spider-Verse (Hindi)!